It’s easy to get hungry in between meals; sometimes, three just isn’t enough, especially if you have an active lifestyle.And many times, you may find yourself reaching for unhealthy options at those times. But it is possible to eat healthy snacks—it’s about choosing healthy foods to fill your stomach to help you feel full until your next meal. Here’s a list of healthy, portable snacks; some require refrigeration or a microwave, but you can stash most in your office for work breaks. Made from sesame oil and chickpeas, hummus is rich in proteins, and a good source of fiber and healthy fat; carrots are rich in potassium and vitamin A. Pairing the two makes a perfect snack that’ll keep you full for longer. Eight small carrots contain about 30 calories, and two tablespoons of hummus contain about 50 calories. You can also pair hummus with other fresh vegetables such as broccoli, celery or cauliflower. It can also be paired with baked pita bread pieces or pita chips. According to a study that the Ohio State University carried out in 2016, hummus can help manage blood glucose, insulin and weight control. A small sandwich makes a perfect healthy snack for an afternoon break. Don’t opt for a regular-sized sandwich, because it’s too big to be eaten as a snack at that time of the day. Veggies, whole grain bread and lean turkey breast or ham are good ingredients for your sandwich. It’ll nourish you with less than 300 calories. Consider a “grown up” peanut butter and jelly sandwich for an afternoon snack. It can be made using exotic nut butter, whole grain bread, and fruit spreads. It’s just like a fruit-and-nut snack, but more satisfying and fulfilling. 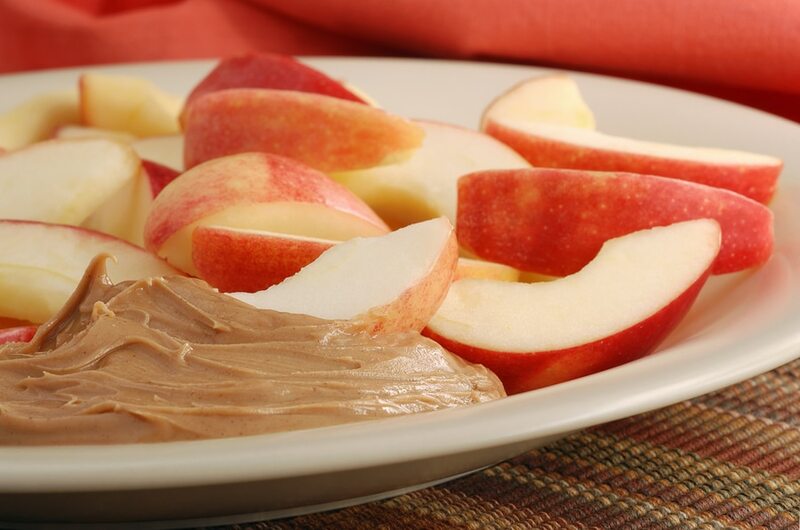 Apples are rich in fiber; pair one with sugarless almond or peanut butter for a low-calorie snack you’ll love. An apple contains 4.4 grams of fiber, 95 calories, 28% of vitamin C, and 25 grams of carbs to keep you healthy and full. Unsweetened, plain Greek yogurt and fresh fruits can also make a healthy snack. It’s rich in protein, calcium, and probiotics—which are good for your gut health. Moreover, it’ll add only 150 calories to your daily intake. Touch it up with drizzles of honey or a sprinkling of pecans. A cup of Greek yogurt can provide you with meatless protein equal to what you’d get from a 7 oz piece of skinless chicken breast. Rice cakes, popcorn, crackers with tuna or cottage cheese, and fresh fruit with nuts also make healthy snacks you can enjoy during your work breaks. Contact us to find out more information about healthy snacks you can carry to eat on the go.